You're going to be spending a lot of time planning the perfect dorm room. You're going to be planning your dorm bedding and what your dorm desk will look like and it's super exciting to think about all those things. The trouble you may come to is your wall decorations for dorms. You may want to create a unique college dorm room that doesn't look like anyone else's and therefore want some different dorm essentials. College posters are basic college supplies that every college student goes to college with. They're cheap dorm supplies and they are great for dorm decorating. However, you may want something a little different even from your basic dorm posters of your favorite movies in your dorm necessities. For cool college wall decor that will make your college dorm room unlike anyone else's, look no further than our Divi Divi Tree College Door Poster! 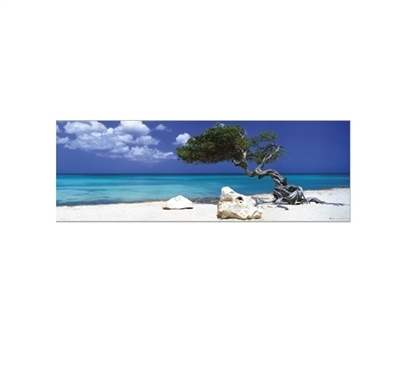 Our Divi Divi Tree Dorm Door Poster is absolutely stunning. It will look especially amazing if you have a beach theme planned for your college dorm room. This dorm essentials item features a gorgeous beach scene with white sand, aqua ocean water, and a clear blue sky with the faintest hint of clouds. Off-center to this already gorgeous scene is a simple Divi Divi Tree. The beautiful scene will truly complete your college dorm room decor and make your college dorm room a relaxing place to study and well...relax! This dorm essentials item is also oversized so it will look great with your dorm bed, dorm dresser, or dorm desk centered underneath it!